We’ve got many requests for talks on React Native, and so here is Joe delivering excellent walkthrough, with updates on current status and new features. React Native now includes support for ES6 out of the box, thanks to Babel - which means you can start using most of the ES6/7 syntax goodness today. Michal presented a web app framework called FluxApp. It is isomorphic, with immutable centralised state and semi/automatically generated actions. Robbie delivered an important message on code re-usability when developing for Web and native platforms with React. According to a recent tweet Facebook was able to reuse 87% of the code on Ads Manager app between iOS and Android versions. In other news, React 0.14 version will move DOM rendering out of the core package. At the moment it is fair to say that you can re-use your flux architecture, dispatchers, actions, events and data fetching code across platforms. In future it might be possible to also recycle UI components - at least to some extent. James shared a story of Digital Inclusion Network project where young people get a hands on experience with latest tech and software. 3D printing, virtual reality, software development and necessary tools are all made available for any young person who wants to get involved. There is a Kickstarter campaign currently going to support this project. 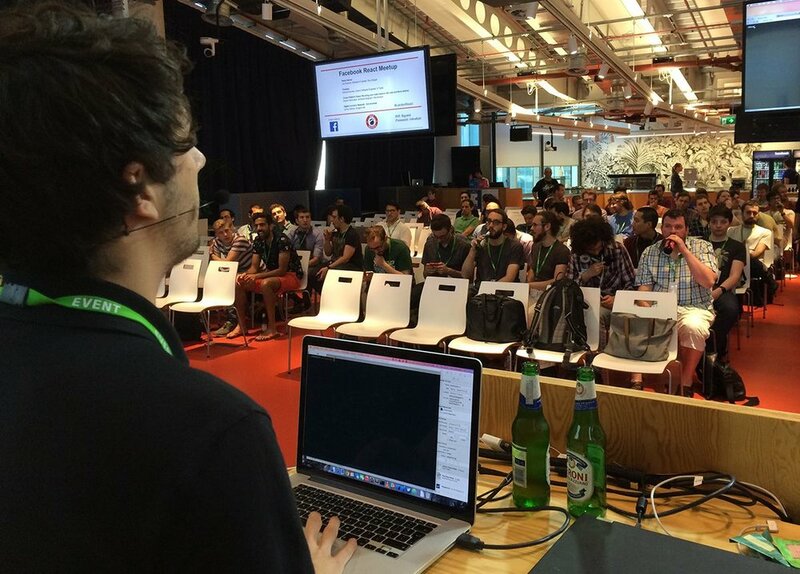 As usual, you can follow @londonreact for updates on the next meetup and be first in line to get your ticket. Huge thanks goes to Facebook for helping out with the venue and filming of the talks.